Finding the perfect pre workout is no easy task. Goldilocks thought she had it tough having to choose between 3 options, but the modern day athlete literally has thousands of different pre workouts to choose from when purchasing their training fuel. The problem with 99% of the pre workouts on the market is that they’re poorly formulated -- over-stimmed, under-stimmed, or improperly dosed. On top of that, the ones that are decently formulated are pretty much undrinkable by modern supplement standards. BPS Nutrition surveyed the current landscape of pre workouts and said, ENOUGH! They’ve created the ultimate pre workout that hits all the right notes, at all the right doses. 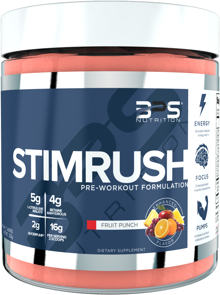 StimRush is the result of countless hours of research and development to deliver the most complete, well rounded pre workout that also tastes great. Each serving delivers the energy you need to survive the most intense workouts and the pumps to match. One sip of StimRush and you’ll wonder why no other supplement tastes this phenomenal. Are you ready for the rush?! Nothing is better than getting a massive, raging pump during your workout. Something about those gorging veins and bulging muscles just makes you feel unstoppable in the gym. You’re guaranteed to have a tremendous pump during your workout thanks to 4 grams of pure L-Citrulline, one of the most effective nitric oxide boosting compounds available. L-Citrulline has been shown to be significantly better for increasing nitric oxide production than L-Arginine due to its superior bioavailability in the body. Greater nitric oxide production means you’ll have superior vascularity, blood flow, vasodilation, and most important of all, PUMPS! At the beginning of a workout, you’re firing on all cylinders and performance is at an all-time high. However, the deeper you get into your workout, the faster you begin to fatigue and your endurance is rapidly fleeting. That doesn’t always have to be the case though, if you’ve got beta alanine by your side! Beta alanine is the incredibly popular endurance-boosting supplement that increases your stamina by increasing carnosine concentrations in your muscles. Carnosine is a powerful compound that buffers acidic ion accumulation in your muscles, offsetting the “burn” that hits mid-set, enabling you to sustain your high level of performance all workout long. This promotes greater endurance, strength, and performance[7,8,9], qualities important to any athlete. Taurine is a conditionally essential amino acid found abundantly in the brain and skeletal muscle tissue. In skeletal muscle, taurine functions as an osmolyte, regulating fluid balance and cell volume as well as supporting cellular hydration. This amino acid improves performance, helps reduce the onset of fatigue, and aids hydration. Taurine also interacts with GABA receptors in the brain, which researchers believe is the reason taurine exerts anxiolytic (anxiety-reducing) effect. Combining it with caffeine, our next ingredient, may help to tighten the focus and offset jitters some individuals experience when taking caffeine, providing a sustained and controlled energy experience. Few things give you the increased energy, motivation, and desire to train hard like caffeine. It’s been around for thousands of years and has been powering athletes to greatness since the first caveman outran a ravenous cheetah. StimRush includes a robust 350mg pure caffeine anhydrous giving you an immediate surge of energy, motivation, and aggression. But, StimRush isn’t all about the caffeine, as you’ll soon see, there’s several other stimulants included to support the intense energy experience that is StimRush. Found in Citrus Aurantium and barley, hordenine is a powerful beta-2 adrenergic agonist that stimulates the body’s natural fat burning processes, helping your body to use fat for fuel while training, thereby sparing your glycogen stores for the really intense work. Hordenine also helps relax bronchial passages and increase blood flow, which supports easier breathing and better oxygen and nutrient delivery during training, both of which aid athletic performance. Theobromine is a chemical relative of caffeine, another xanthine molecule. It’s found naturally in dark chocolate, kola nut, and tea leaves. While structurally similar to caffeine, theobromine provides a much more subtle energy boost compared to the harsh, immediate energy rush of caffeine. Combining the two provides a “best of both worlds” approach, where caffeine gives you the instant energy to get to work in the gym, while theobromine provides the sustained energy that may help offset any potential crash users experience from caffeine. Additionally, theobromine also differs from caffeine in that it is a vasodilator. As a vasodilator, theobromine helps widen and relax blood vessels, reducing blood pressure and promoting greater blood flow. [15,16,17] With greater blood flow, comes increased oxygen and nutrient delivery to working muscles, which enhances athletic performance, endurance, and pumps! Cocoabuterol is a patented cocoa extract standardized to 50% cocoa alkaloids, supplying N-Coumaroyldopamine, N-Caffeoyldopamine, EGCG and Theobromine. N-coumaroyldopamine and N-caffeoyldopamine can stimulate β2 adrenoceptors, increasing cAMP levels, which support fat loss and muscle growth. Through COMT inhibition, N-coumaroyldopamine and N-caffeoyldopamine can stay active longer, promoting increased cAMP levels via beta-adrenoceptor agonism, supporting muscle growth and fat burning. 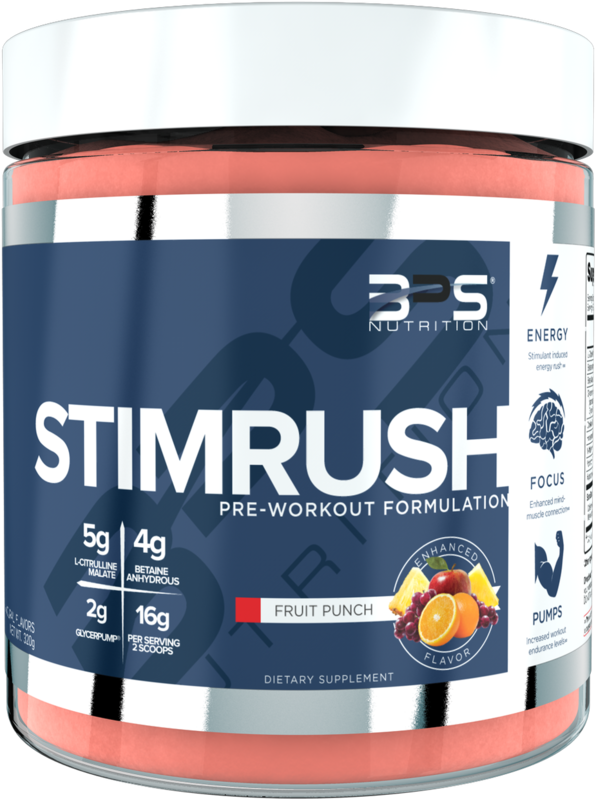 To bring the complete energy rush experience of StimRush together, BPS Nutrition includes the powerful CNS stimulant yohimbine. Used in combination with caffeine and the other powerful beta receptor agonists, yohimbine gives StimRush the kick that really sends its energy surge over the top. Yohimbine is an Alpha-2-Adrenergic receptor antagonist that increases adrenaline (epinephrine) and noradrenaline (norepinephrine) levels in the body, activating the “fight or flight” response. This prominent energy booster also supports fat burning by inhibiting the fat storing mechanisms of your body. With yohimbine, you’ll be more alert, focused, and energized, while also torching fat at the same time! To assess tolerance, mix 1 scoop StimRush with 6oz of water 15-20 minutes prior to training. If well tolerated, mix 2 scoops with 12oz of water 15-20 minutes before training. DO NOT exceed 2 scoops per day. There’s no denying that StimRush provides the most balanced and comprehensive formula on the market. Energy, pumps, focus, and performance -- StimRush gives it all to you, along with next-level flavoring. You’ve demanded the best, and we’ve delivered it to you with StimRush. Now, it’s up to you to put in the work! Dombovy-johnson, M. (2012). The Effects of Taurine and Caffeine Alone and in Combination on Locomotor Activity in the Rat. Colgate Academic Review, 7(Spring 2010), 170–188. Baggott MJ, Childs E, Hart AB, et al. Psychopharmacology of theobromine in healthy volunteers. Psychopharmacology. 2013;228(1):109-118. doi:10.1007/s00213-013-3021-0. CORNISH, H. H., & CHRISTMAN, A. A. (1957). A study of the metabolism of theobromine, theophylline, and caffeine in man. The Journal of Biological Chemistry, 228(1), 315–323. Nehlig A. The neuroprotective effects of cocoa flavanol and its influence on cognitive performance. British Journal of Clinical Pharmacology. 2013;75(3):716-727. doi:10.1111/j.1365-2125.2012.04378.x. Berdeaux R, Stewart R. cAMP signaling in skeletal muscle adaptation: hypertrophy, metabolism, and regeneration. American Journal of Physiology - Endocrinology and Metabolism. 2012;303(1):E1-E17. doi:10.1152/ajpendo.00555.2011.